Sponsored by the Boulder City Community Club. Faith Christian Church Christmas Cookie Sale is Sat. Dec. 1 from 9am to noon at 1100 Buchanan Blvd. Boulder City. Buy homemade cookies and candy for $6 a pound. Great gift idea! Everyone loves cookies! Come early for the best selection. Proceeds go to charity projects. Don't you just love it when you get a great smile and thank you for simply holding the door for someone? Well let's see if we can celebrate service and civility in Boulder City by putting our best foot forward and find little ways to do something good for someone else on Boulder City's Service Saturday. Then share your experience on social media with #BCServiceSaturday. Join rangers and volunteers as they participate in the Boulder City Santa's Electric Night parade. Stop by the Lake Mead National Recreation Area Headquarters for s'mores during the parade. 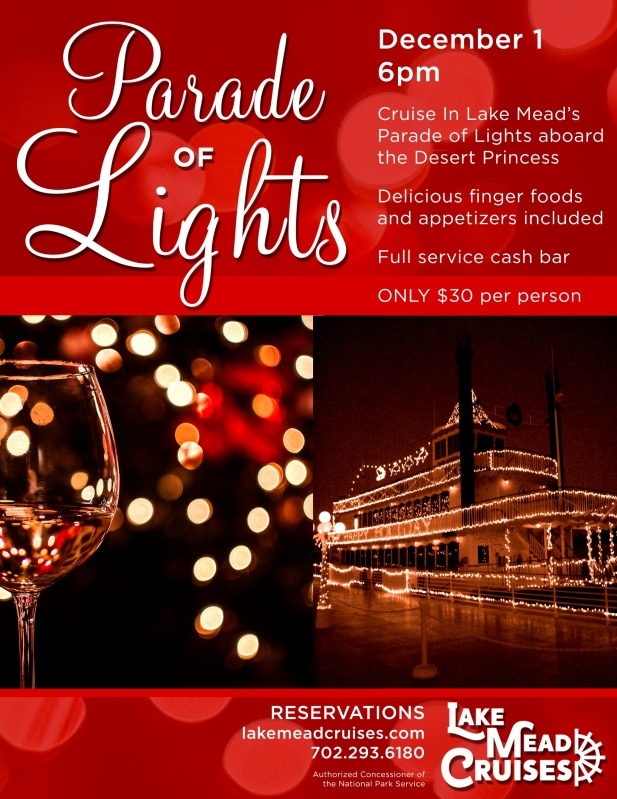 Experience Lake Mead's dazzling Parade of Lights from the cozy comfort of the Desert Princess paddlewheeler. Enjoy appetizers and finger foods throughout the cruise (included in the fare) and toast to the season at our full-service cash bar. Join us in welcoming the new owners of Boulder Bowl! They have lots of tournaments and events happening in December so be sure to stop by to learn more! Join us at Lakeview Terrace as we celebrate St. Nicholas Day with some sweet treats and Holiday Karaoke with Dawn Fellmer. Red Mountain Music Company presents a Christmas concert titled 'Twas the Night! featuring the Red Mountain Choir and the Martha P. King Singers. Enjoy the Desert Discover Center and ranger chats throughout the day. There will be discounted items in the visitor center park store during the open house. Call for more information. Best Dam Wine Walk - Ugly Sweater! Join us for Check-In at Grace Christian Academy from 4:00 - 6:30 pm to receive your ticket and wine glass. There are over 25 stops you can visit to get your pour of all different kinds of Wine. Download the Boulder City Chamber of Commerce App to scan the QR codes at over 25 different locations for a chance to win a free Wine Walk ticket and glass for next time. Taste of Boulder City - Restaurant Marketing Opportunity. Great opportunity to showcase your business to over 300 people. Join us outdoors for a Fitness Hike & HIIT workout out the Historic Railroad Hiking Trail. This is a free community event. $10 Per Person. Rides run from 10:00 am to 3:00 pm. Every hour on the hour. Join us to hang with Santa and enjoy a beautiful ride through the north side of the Eldorado Valley. Nearly 700 athletes will race through Lake Mead National Recreation Area. Learn how to make creative and delicious cookies ! Please join us for our Ugly Sweater Contest and Silver State Dive Club meeting, fun for the whole family. Join us for our Monthly Networking Mixer at the "Christmas House" with Dale Ryan and Dyanah Musgrave! A free, monthly event dedicated to your health & wellness. Join Lisa L. this month to discuss hormones & weight loss. Kickoff with fabulous and fun stories with Storyteller Linda Hartman ! Held in the Community Room for all ages. Join the library for storytime, crafts and fun holiday activities at the Boulder City/Hoover Dam Museum. Admission is free and all ages are encouraged to participate. Come join us for our Holiday Pet photo shoot with Santa and Mrs. Claus. No appointment necessary. Photos by 28 Sunflowers photography and Fundraiser for See Spot Run. "Harmony for the Holidays" English Handbell Choir concert sponsored by St. Andrew's. 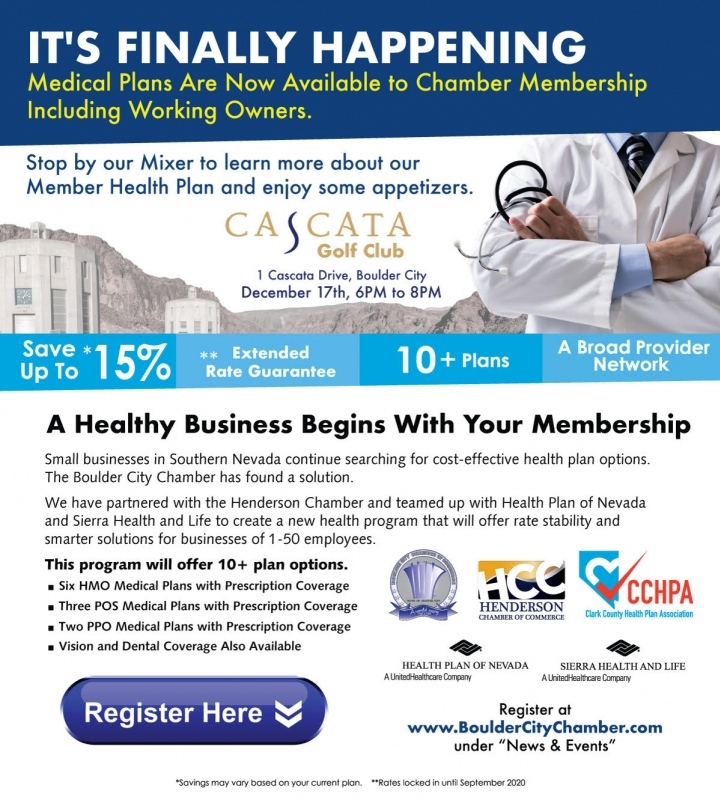 Please join us at the Cascata Golf Club for a joint Mixer with the Henderson Chamber of Commerce featuring our newly released Health Insurance Plans. Find out how to take advantage of the 10+ plans offered by Health Plan of Nevada and Sierra Health and Life. Meet and greet with Brokers and United Healthcare representatives. For all ages in the Community oom. Join us for a one man performance of the beloved holiday classic, "A Christmas Carol"
Join us for fun holiday stories, crafts, and activities! For ages 12 and up in the Community Room. Join us to make presents to give away or decorations to keep ! A (one man) Christmas Carol, starring Kellan Baker at 7:00 pm. Sponsored by Emergency Aid of Boulder City. Please email badmoonbooking@gmail.com for ticket information. Tickets are $20. The Mostly Dusty Carolers at 6:00 pm.